On Sunday 28th February, 2016, the SCOAN Choir ensured that the congregants danced away all their fears and burdens, replacing them with the hope and faith that abound in the Word of God. That is always the case when the Spirit of the Lord is upon the souls of his children – they will dance a living dance! Mrs Mukambonera Claudine, a Rwandan national residing in France visited The SCOAN with a couple of challenges. She had been applying for citizenship in France but all her efforts hit the brick wall. Her bedwetting problem was perhaps the biggest and most embarrassing challenge that had troubled her right from birth. During her school days, her fellow students would run away from her saying that she had an offensive odour. While in the boarding house, no student wanted to share the same bed with her. Sometimes, while she slept on the upper bunk, her urine would trickle down on the body of the student who slept on the lower bunk. She was left alone in her world and was made to feel very bad about herself. She was always washing and cleaning the hostel in order to minimize the stench of urine that came from her. Those were really challenging moments in her life. Her marital aspirations were also troubled by her bedwetting problem. On one occasion, a suitor was discouraged by someone who informed him that she was bedwetting. Though she eventually married her suitor, the bedwetting problem continued into her marriage. To save her head, she would ensure that she slept together with her children and would ascribe her bedwetting to them. Even when she shared a bed with a friend in France, it was the same sad story. Sometimes, she would be on the street crying and bemoaning her unfortunate lot in life. When she came to The SCOAN, she was placed at the Prayer Line where the man of God prayed for her and subsequently gave her the Morning Water. On her return to France, she ministered the Morning Water devotedly with prayers. To the glory of God, she was granted French citizenship. The bedwetting problem also came to a permanent end. Joy and self-esteem which were seriously lacking in her life have now returned. She praised God for answering her prayers. Ambassador and Mrs Raphael Horsfall came to The SCOAN with the problem of recurrent miscarriage. Since they got married, Mrs Horsfall had been experiencing recurrent miscarriages. Whenever the pregnancy was six weeks old, she would have a nightmare in which she would find herself eating in the dream. The aftermath of that nightmare was that she would start bleeding, thereby losing the pregnancy. Medical appointments with the best gynaecologists could not help just as all diagnosis failed to detect any problem. Her husband is an Ambassador of Peace and Conflict Management with the Presidency in Abuja and who, in company of other Niger Delta dignitaries, had visited The SCOAN in 2009 in search of a spiritual solution to the problem of militancy. According to Ambassador Horsfall, the spiritual guidance and direction given to them by the man of God resulted in the creation of the Amnesty programme by the late President Umaru Musa Yar’adua. Ambassador Horsfall believed that if the man of God could solve a national problem that almost crippled the national economy, then his wife’s case was miniature. His candid conviction would eventually prove true indeed. 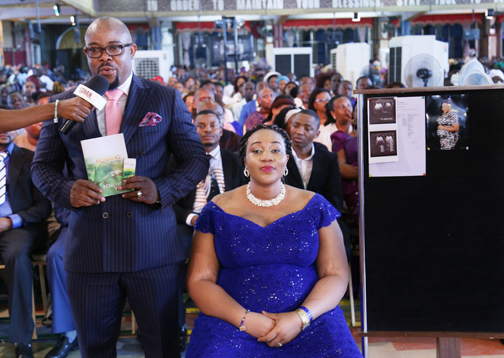 The couple visited The SCOAN and received prayers as well as the Morning Water. As they returned to Abuja and continued to minister the Morning Water, the hand of God upon their case was made manifest. One afternoon, as he was about to have his lunch, Ambassador Horsfall received a cheery news from his wife. She was pregnant and this time, the pregnancy has come to stay. Today, Mrs Horsfall is eight months pregnant. Grateful to God for the miracle, Ambassador Horsfall urged leaders to seek the face of God in everything they do. To end his testimony, Ambassador Horsfall explained his recent post as Senior Special Assistant to the Political Advisor of the former President of Nigeria, Dr. Goodluck Jonathan. During a time of tension in the in the run-up to the election, there was confusion and worry as to which direction to follow in the government. They had sought advice from different places. Ambassador Horsfall came to The SCOAN and pleaded with Prophet T.B. Joshua for God’s opinion and the man of God clearly stated that the election had been lost and they should concede defeat graciously. He took the instruction in righteousness back to the Aso Villa and told the president. A few months later, people wondered why the president didn’t fight back or annul the election as he had the powers to do so. This was the reason why. For Mrs Rebecca Odoi Laryea, it was the problem of indebtedness that brought her to The SCOAN after she and her husband were duped by a trusted family friend who absconded with the sum of eighty thousand dollars paid in by a customer for the purchase of a coaster bus. All efforts to retrieve the money remained futile. 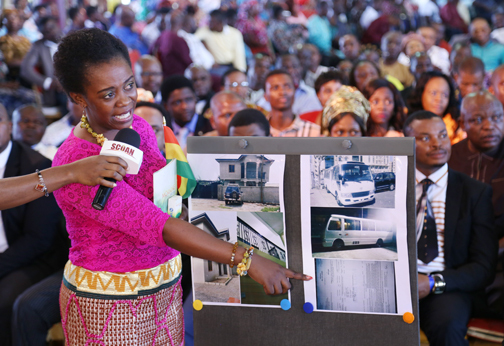 The automobile business of the Ghanaian couple ran into murky waters as all their savings went down the drain in their bid to locate the duper. After exhausting all options, the couple visited The SCOAN. At The SCOAN, they received the Morning Water and returned to Ghana with faith. Ministering the Morning Water, they called on God to save them from the mess they had found themselves in. Within a short time, the man who had absconded with their money called her husband from Dubai, paid her husband’s air fare to the Middle East city, refunded the money for the bus with an extra six thousand dollars on top to enable them purchase the latest brand of coaster. The couple eventually bought and shipped a brand new coaster bus for their business at the expense of the lost-but-found friend. Apart from recovering their money, the couple who had faced accommodation problems, were able to build an apartment of their own in a prime location in Accra within seven months. Thanking God for taking away shame and reproach from their lives, Mrs Odoi Laryea advised people to look up to God when their human strength fails them. “There is a brother; you are going to the embassy on Thursday. You have the document. You have been there two to three times but whatever happens, don’t be disappointed…” It was with these words that Prophet T.B. Joshua prophesied the case of Mr Hilary Ugochukwu Anyamene. The native of Anambra State, Nigeria was facing challenges with his visa application. As a business man who specialised in marketing American spares, he needed to get his visa in order to go over to the US to ship products to Nigeria. On two occasions, his visa applications were rejected. He made up his mind to apply for a third time and also insisted on visiting The SCOAN before embarking on the third journey to the US embassy. Even though friends had tried to discourage him from visiting The SCOAN, his mind was made up. For them, it was better that he should wait and reapply after one year. Visiting The SCOAN, he received a prophetic message from Prophet T.B. Joshua regarding his visa issue. That message turned around his situation for good. He returned home and prepared for another date with the American embassy. On getting there, the lady who interviewed him only asked a few questions after which she told him that his visa application was successful. 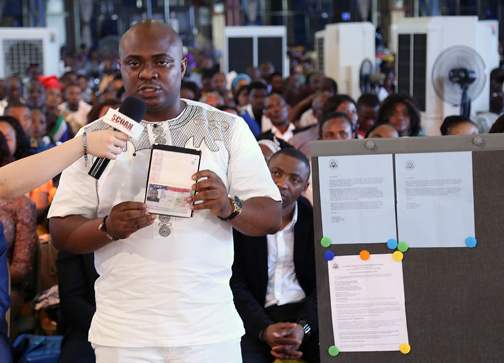 Filled with joy and displaying his two-year multiple entry visa, Mr Anyamene thanked God for granting his heart’s desire. 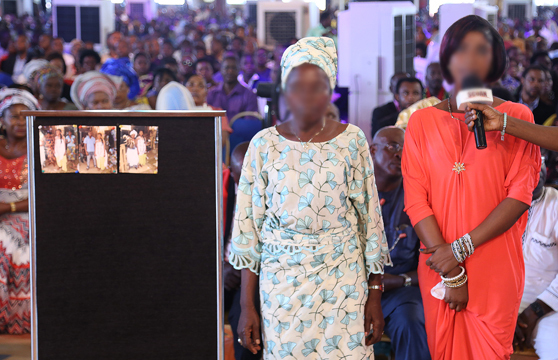 “I don’t want her to have any good in her life… just to destroy her life to make her miserable… her family – everyone is miserable…” Amidst heavy pummelling by the undiluted power of the Holy Ghost, the evil spirit in the young woman cried out revealing all the wicked plans it had for her life. Even the physical appearance of Miss Biliki showed that something was amiss with her spiritual life. A ring in the nose, another beneath the lips plus a plethora of tattoos all over the body – all those were relics of her association with the marine kingdom. Even her mother knew that she had an evil spirit which had caused so much havoc in her life. At 15, she absconded from home only to team up with a prostitution cartel in Lagos Island. A woman who traded in prostitutes promised to take her out of the country to Cotonou where she became a professional prostitute. While nine other girls were sold away, she was kept because of her age. As she plied her trade in the illicit business, she ran into a man who took her away to a new location. After two weeks, the man left. Young Biliki started working in night clubs to make ends meet. In her long romance with prostitution, she had travelled to a couple of countries, including Niger where she met a witch doctor who promised to exorcise the evil spirit tormenting her life. After spending money for the spiritual exercise, her life became worse. She returned to Cameroon and became a stripper, dancing in strip clubs and exposing her nakedness to the evil delight of irresponsible men. Most of the so-called witch doctors who claimed they would help deliver her from the evil spirit tormenting her life ended up sleeping with her. She had come to The SCOAN to test the power of God in Prophet T.B. Joshua. That was the greatest but best mistake she made. During Mass Prayer, the fire of the Holy Ghost located her and beat the evil spirit blue-black before sending it back to the pit of hell. 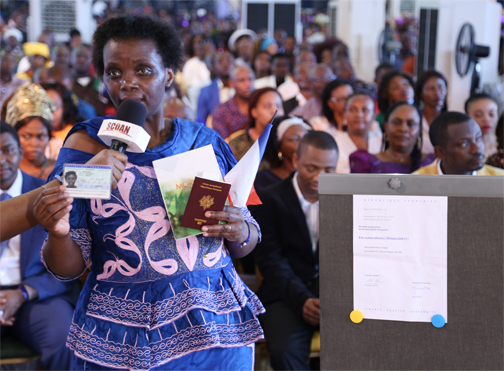 Renouncing her former life amid tears, Miss Biliki advised people to put their trust in God while promising to dedicate the rest of her life to serving Him. MAY THE WORD OF GOD REMAIN IN OUR HEARTS AND MAY WE SERVES THE LORD IN TRUTH AND IN SPIRIT.AMEN. Emmanuel! Glory be to God for a faith provocation message by Prophet TB Joshua in Jesus Christ’s name. Thank you Jesus blessed be your Holy name. your in GODS eyes . The hardest walk is not walking with the Lord. God of Abraham, Isaac and Jacob who is also The God of Prophet T B Joshua and my God, I thank you for all the positives taking place at SCOAN, watched through Emmanuel TV. Dear God locate me and my family and deliver us also from sickness, poverty and indebtedness in Jesus Christ’s Name. Bless Prophet T B Joshua, his team and family in Jesus Christ’ Name. Amen. I thank the Almighty God for such an inspiring message through His servant and I am so blessed, my faith is lifted up everyday. May the Good Lord bless T.B.Joshua and anoint him more so that more souls may b saved. I need deliverance, I need some one to help me financially to get to SCOAN, thank you. Now to Him who is able to do exceedingly, abundantly above all that we ask or think, according to the power that works in us. The Holy Bible is informing us that: Now to Him who is able to do exceedingly, abundantly above all that we ask or think, according to the power that work in us. In other words the the Holy Bible is advising us that: Our Lord and Savior Jesus Christ is able to do immeasurably, give more than all we ask or imagine, according to His power that is at work within us. God Almighty is able to keep His children from stumbling and to present you faultless before the presence of His glory with exceedingly joy. All the works of the Lord Almighty will praise Him and all Your children will bless You. They shall speak of the glory of Your everlasting kingdom and they shall talk of Your power. To make men to know Your might acts and Your glorious majesty of Your kingdom which is an everlasting kingdom. And Your dominion endures throughout all generations and it is forever more. Our Lord and Savior Jesus Christ is Holy, He is good, He is a wonderful Savior, He is gracious, He is loving, He is our creator, He is merciful, He is compassionate, He is powerful, He is glorious, He is the deliverer, He is the Great Physician, He is the redeemer, He is the blessing provider, He is the same yesterday today and tomorrow, He is King of kings and Lord of lords. The Lord Almighty is able to uphold all His children and He raises up all who are bowed down. The Lord Almighty is righteous in all His ways. Gracious in all His works. He is near to all who call upon Him. To all who call upon Him in truth. He will fulfill the desires of those who love Him. He preserves all who love Him. For everyone who has will. Will be given more and he will have in abundance. You ought to be strong and courageous, because the Lord our God is with you, He will never leave you nor forsake you. You can do everything through Him who gives you strength all the time. God Almighty is not a man, that He should lie. He is not a man who changes His mind. Whatever He promises He does. He speaks and it is done and will He not make it good. If He blesses you He cannot reverse it, He cannot call it back. Everything that God does endures forever nothing can be added to it and nothing taken from it. God Almighty is merciful and gracious, longsuffering and abounding in goodness and truth. Keeping mercy for thousands. The Lord loves His children He will bless you and increase your numbers. He is the God of heaven, He is great and awesome God who keeps His covenant of mercy and love to all His people He created. Many waters cannot quench love. Nor can the floods drown it. His goodness and love will follow His children all the days of their lives and they will dwell in the house of the Lord Almighty forever. In 2 Corinthians 9:8 And God is able to make all grace abound toward you that you, always having all sufficiency in all things, may have an abundance for every good work. In other words God Almighty is able to make all grace abound to you, so that in all things at all times, having all that you need, you will abound in every good work. I give bless and glorify the Lord Almighty who is able to make you stand firm in your faith. I bless and glorify the Lord Almighty because His dominion if forever more. In the name of Jesus Christ. Emmanuel-God with us. May the gracious Lord Almighty do immeasurably more than you ask or imagine, according to His power. May He richly bless you and your family with all of Gods blessings. May He grant you abundant prosperity in every area of your life. May He bless all the work of your hands and may He bless everything you put your hands to. May He bless you in the city and bless you in the country. May He bless you and make you fruitful and increase your numbers. May He give you success in whatever you do according to His will. May He meet all your needs according to His glorious riches in Christ Jesus. May He show you the path of life and fill you with joy in His presence. May He fill your house with His glory. In the name of Jesus Christ. Thank you papa T B Joshua for allowing yourself to be used by God you have really touched my heart and for that I see progress in my life and each time I have a dream of you my life does not remain the same, and I know that one day whatever you have revewed in my dreams it shall come to pass, that much I know because you are a sent from our Abba Father God. Where can we go from His presence? No where. May the gracious Lord Almighty fulfill all His promises to you. May He fulfill all He has planned for you. May He give you the desires of your heart and make all your plans succeed according to His will. May He pour out His love into your heart by the Holy Spirit whom He has given you. May He richly provide you with everything for your enjoyment. May you be glad and rejoice in the love of God Almighty. May He show you the path of life and fill you with joy in His presence. May He fill your house with His glory. May He show you and give you His incomparable riches of His grace, expressed in His kindness to you. May He teach you what is the best for you and direct the way you should go. May He meet all your needs according to His glorious riches in Christ Jesus. In the name of Jesus Christ. I grolify the holy name Jesus for life of Prophet TB Joshua,I am writting to ask for a help,I can’t afford to book for flight from south Africa to SCAON Nigeria.so am asking for flight tickets so that I also I may go and meet Man of God Prophet TB Joshua.Any one who is willing to hep me please do it through SCOAN they will contact me,thank you and God bless all…. Emmanuel-God with us. May the gracious Lord Almighty meet all your needs according to His glorious riches in Christ Jesus. May He give you more than you need so that you will always have all you need for yourselves and more than enough for every good cause. May you find great delight in the love of the Lord and He will give you the desires of your heart according to His will. May He grant abundant prosperity in every area of your life. May He bless all the work of your hands and may He bless everything you put your hands to. May you be blessed in the city and blessed in the country. May He richly bless you and your family with all of Gods blessings. may He make you fruitful and increase your numbers. In the name of Jesus Christ. Where can we go from His presence? No where. May the gracious God Almighty show you the path of life and fill you with joy in His presence. May He fill your house with His glory. May He show you and give you His incomparable riches of His grace, expressed in His kindness to you. May He teach you what is the best for you and direct the way you should go. May He meet all your needs according to His glorious riches in Christ Jesus. May find great delight in the love of the Lord and He will give you the desires of your heart according to His will. May He strengthen you, help you and uphold you with His righteous right hand. May He do immeasurably more than you ask or imagine, according to His power. May He richly bless and your family with all of Gods blessings. In the name of Jesus Christ. Emmanuel-God with us. May the gracious God Almighty grant you abundant prosperity in every area of your life. May He bless all the work of your hands and may He bless everything you put your hands to. May He bless you and make you fruitful and increase your numbers. May He give you success in whatever you do according to His will. May He richly provide you with everything for your enjoyment. May you be glad and rejoice in the love of the Lord Almighty. May He show you the path of life and fill you with joy in His presence. May He fill your house with his glory. May He show you and give you His incomparable riches of His grace, expressed in His kindness to you. May He richly bless you and your family with all of Gods blessings. May He take care of you. may He fulfill all His promises to you. May He fulfill all He has planned for you. In the name of Jesus Christ. Praise the Lord! Prophet , please pray for me and my family so that Almighty God can deliver us from the spirit of Poverty, indeptedness, stagnation, unfaithfulness ,unemployment, Hardship, homelesness, unhappy marriage. Please Prophet, i am going through all these spirits at once and it is truly a heaviest burden. Emmanuel! God with us. Emmanuel-God with us. May the gracious God Almighty richly bless you and your family with all of Gods blessings. May He take care of you. May He fulfill all His promises to you. May He fulfill all He has planned for you. May He give you the desires of your heart and make all your plans succeed according to His will. May He pour out His love into your heart by the Holy Spirit whom He has given you May He richly provide you with everything for your enjoyment. May you be glad and rejoice in the love of God Almighty. May He show you the path of life and fill you with joy in His presence. May He fill your house with His glory. May He show you and give you his incomparable riches of His grace, expresses in His kindness to you. In the name of Jesus Christ. Emmanuel-God with us. May the gracious God Almighty show you and give you His incomparable riches of His grace, expressed in His kindness to you. May He teach you what is the best for you and direct the way you should go. May He meet all your needs according to His glorious riches in Christ Jesus. May He grant you abundant prosperity in ever area of your life. May He strengthen you, help you and uphold you with His righteous right hand. May He do immeasurably more than you ask or imagine, according to His power. May He lavish you with His love. May He lavish you with the riches of His grace and may He lavish you with all wisdom and understanding. May He give you success in whatever you do. May He richly bless you and your family with all of Gods blessings. In the name of Jesus Christ. Emmanuel-God with us. May the gracious God Almighty meet all your needs according to His glorious riches in Christ Jesus. May He grant you abundant prosperity in every area of your life. May He richly bless you and your family with all of Gods blessings. May He bless all the work of your hands and may He bless everything you put your hands to. May He bless you and make you fruitful and increase your numbers. May He give you success in whatever you do according to His will. May He give you more than you need so that you will always have all you need for yourselves and more than enough for every good cause. May He teach you what is the best for you and direct the way you should go. In the name of Jesus Christ. Thank you lord for the powerful testimonies and the powerful word that was enriching. 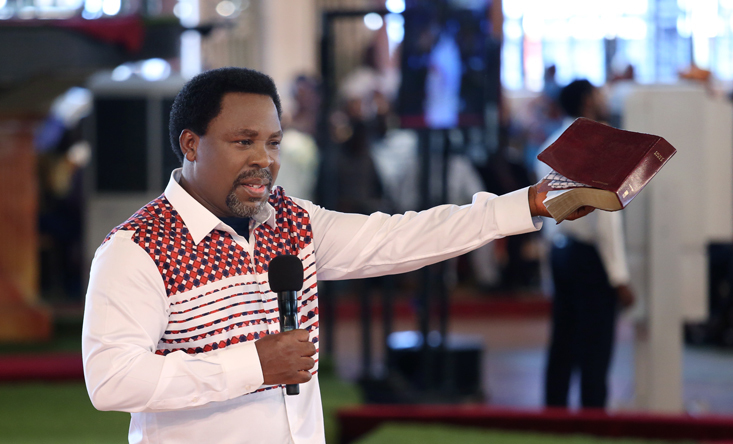 Thank you father God for given us Prophet T. B. Joshua in our generation and how you are using him to teach us your word, I am still learning from his teachings of the Holy Bible and how to apply it in my daily life. I am praying that one day the lord will make it possible for me go to SCOAN and meet Prophet T. B Joshua. Amen Emmanuel. Where can we go from His presence? No where. May the gracious God Almighty richly bless you and your family with all of Gods blessings. May He take care of you. May He fulfill all His promises to you. May He fulfill all He has planned for you. Ma He show you the path of life and fill you with joy in His presence. May He fill your house with His glory. May He show you and give you His incomparable riches of His grace, expressed in His kindness to you. May He teach you what is the best for you and direct the way you should go. May He meet all your needs according to His glorious riches in Christ Jesus. May He lavish you with His love. May you find great delight in the love of the Lord and He will give you the desires of your heart according to His will. In the name of Jesus Christ. I thank God for this Ministry. Emmanuel-God with us. May the gracious God almighty fill your house with His glory. May He richly bless you and your family with all of Gods blessings. May He meet all your needs according to His glorious riches in Christ Jesus. May you find great delight in the love of the Lord and He will give you the desires of your heart according to His will. May He strengthen you, help you and uphold you with His righteous right hand. May He grant you abundant prosperity in every area of your life. May you be blessed in the city and blessed in the country. May He bless you and make you fruitful and increase your numbers. May He give you the desires of your heart and make all your plans succeed according to His will. In the name of Jesus Christ. Thank you Lord for giving us this Ministry of Prophet TB Joshua. The prayers we receive in response are Powerful and Really life Changing. We thank God for all prayer responses amd May the Good God increase His annointing upon you, in Jesus name. EMMANUEL! God with us. Happy Birthday Emmanuel TV!!! Good morning. Emmanuel! Thank you Lord for raising a good and humble prophet during our time. Thank you for using him to guide,teach and show us the way. He is really a blessing to this generation.May the Lord protect and keep him. Happy birthday Emmanuel TV. The channel that helps us grow in our spiritual walk with the Lord. Emmanuel. Where can we go from His presence? No where. May the gracious God Almighty show you the path of life and fill you with joy in His presence. May He richly bless you and your family with all of Gods blessings. May He fill your house with His glory. May He show you and give you His incomparable riches of His grace, expressed in His kindness to you. May He teach you what is the best for you and direct the way you should go. May He meet all your needs according to His glorious riches in Christ Jesus. May you find great delight in the love of the Lord and He will give you the desires of your heart according to His will. May He make your heart be glad and joyful in His love. May He fulfill all His promises to you. May He fulfill all He has planned for you. In the name of Jesus Christ. EMMANUEL. HAPPY BIRTHDAY EMMANUEL. NOW YOU ARE 10 YEARS OLD. WE THANK GOD FOR THE MIRACLES. THANK YOU JESUS FOR THE LIFE OF PROPHET TB JOSHUA. AMEN. GOOD MORNING. HAPPY BIRTHDAY EMMANUEL TV. WE ARE CELEBRATING WITH YOU EMMANUEL TV. LIVE LONG EMMANUEL TV & PROPHET TB JOSHUA, EMMANUEL FAMILY & PARTNERS. AMEN. Where can we go from His presence? No where. May the gracious God Almighty show you the path of life and fill you with joy in His presence. May He fill your house with His glory. May He richly bless you and your family with all of Gods blessings. May He teach you what is the best for you and direct the way you should go. May He meet all your needs according to His glorious riches in Christ Jesus. May you find great delight in the love of the Lord and He will give you the desires of your heart according to His will. May He strengthen you, help you and uphold you with His righteous right hand. May He keep you away from harm and watch over your life. May He do immeasurably more than you ask or imagine, according to His power. In the name of Jesus Christ. Emmanuel-God with us. May the gracious God Almighty richly provide you with everything for your enjoyment. May you be glad and rejoice in the love of God Almighty. May He give you the desires of your heart and make all your plans succeed according to His will. May He show you the path of life and fill you with joy in His presence. May He fill your house with His glory. May He show you and give you His incomparable riches of His grace, expressed in His kindness to you. May He teach you what is the best for you and direct the way you should go. May He meet all your needs according to His glorious riches in Christ Jesus. May you find great delight in the love of the Lord Almighty and He will give you the desires of your heart according to His will. In the name of Jesus Christ. Thank you man of God and God richly bless you. Jesus I will continue to read your living Word and let my heart every day ponder over the Word of God and live it but not imitate others fake faiths that is splashed everywhere in these end times. Emmanuel-God with us. May the gracious God Almighty richly provide you with everything for your enjoyment. May He richly bless you and your family with all of Gods blessings. May you be glad and rejoice in the love of God Almighty. May He show you the path of life and fill you with joy in His presence. May He fill your house with His glory. May He show you and give you His incomparable riches of His grace, expressed in His kindness to you. May He teach you what is the best for you and direct the way you should go. May He meet all your needs according to His glorious riches in Christ Jesus. May you find great delight in the love of God and He will give you the desires of your heart according to His will. In the name of Jesus Christ. Emmanuel-God with us. May the gracious God Almighty lavish you with the riches of His grace and may He lavish you with all wisdom and understanding. May He make your heart be glad and joyful in His love. May He richly bless you and your family with all of Gods blessings. May He fulfill all His promises to you. May He fulfill all He has planned for you. May He give you the desires of your heart and make all your plans succeed according to His will. May He pour out His love into your heart by the Holy Spirit whom He has given you. May He richly provide you with everything for your enjoyment. May He show you the path of life and fill you with joy in His presence. May He fill your house with His glory. In the name of Jesus Christ. Emmanuel-God with us. May the gracious Lord Almighty richly provide you with everything for enjoyment. May He lavish you with the riches of his grace and may He lavish you with all wisdom and understanding. May He richly bless you and your family with all of Gods blessings. May He make your heart be glad and joyful in His love. May He take care of you. May He fulfill all His promises to you. May He fulfill all He has planned for you. May He give you the desires of your heart and make all your plans succeed according to His will. May He pour out His love into your heart by the Holy Spirit whom He has given you. May He show you the path of life and fill you with joy in His presence. May He fill your house with His glory. In the name of Jesus Christ. happy birthday Emmanuel TV. you have been a blessing to me and my family. everyday we watch Emmanuel TV our lives are changed. thank you Prophet T.B. Joshua and thank you Emmanuel TV and SCOAN team. God bless you. Where can we go from His presence? No where. May the gracious God Almighty show you the path of life and fill you with joy in His presence. May He richly bless you and your family with all of Gods blessings. May He fill your house with His glory. May He meet all your needs according to His glorious riches in Christ Jesus. May He richly provide you with everything for your enjoyment. May He strengthen you, help you and uphold you with His righteous right hand. May He satisfy your desires with good things. May He do immeasurably more than you ask or imagine, according to His power. May He give you peace at all times and in every way. May He grant you abundant prosperity in every area of your life. In the name of Jesus Christ. I had faith that if I can make it to SCOAN, I will receive my miracle, but the problem is I do not have money to travel to Nigeria. One day as I was browsing through the testimonies of people here, I read that a lady was sent the mourning water via DHL I knew it was possible because I use to send documents through DHL to London too. then send her my… full name.. full address… phone number… and payment copy..
after 2days I got everything I requested..
May the good Lord Almighty richly provide you with everything for your enjoyment. May you be glad and rejoice in the love of God Almighty. May He show you the path of life and fill you with joy in His presence. May He fill your house with His glory. May He give you more than you need so that you will always have all you need for yourselves and more than enough for every good cause. May He show you and give you His incomparable riches of His grace expressed in His kindness to you. May He teach you what is the best for you and direct the way you should go. May He meet all your needs according to His glorious riches in Christ Jesus. May you find great delight in the love of God and He will give you the desires of your heart according to His will. May the gracious God Almighty show you and give you His incomparable riches of His grace,expressed in His kindness to you. May He teach you what is the best for you and direct the way you should go. May you find great delight in the love of God and He will give you the desires of your heart according to His will. May He richly bless you and your family with all of Gods blessings. May He lavish you with the riches of His grace and may He lavish you with all wisdom and understanding. May You be glad and rejoice in the love of God. Almighty. May He richly provide you with everything for your enjoyment. May He show you the path of life and fill you with joy in His presence. May He fill your house with His glory. In the name of Jesus Christ..
May the gracious God Almighty give you more than you need so that you will always have all you need for yourselves and more than enough for every good cause. May He show you and give you His incomparable riches of His grace, expressed in His kindness to you. May He meet all your needs according to His glorious riches in Christ Jesus. May you find great delight in the love of the Lord and He will give you the desires of your heart according to His will. May He strengthen you, help you and uphold you with His righteous right hand. May He grant you abundant prosperity in every area of your life. May He bless all the work of your hands and may He bless everything you put your hands to. May He bless you and make you fruitful and increase your numbers. In the name of Jesus Christ. May the gracious God Almighty bless you in the city and bless you in the country. May He bless all the work of your hands and may He bless everything you put your hands to. May He make you the head and not the tail. you shall be above only and not beneath. May He grant you abundant prosperity in every area of your life. May He give you success in whatever you do according to His will. May He strengthen you and help you and uphold you with His righteous right hand. May you find great delight in the love of God and He will give you the desires of your heart according to His will. May He meet all your needs according to His glorious riches in Christ Jesus. In the name of Jesus Christ. MESSAGE FROM PROPHET TB JOSHUA!!! We wish to inform all those who have registered online for visit and have not yet received their invitation letter(s) and wants to VISIT SCOAN this month. ORDER FOR THE NEW Morning anointed water,sticker,mirror book and your invitation letter to the Scoan,You are to contact us here in our admin for verification department email..: scoan-churchworldwide@ minister.com , If you would like to join EMMANUEL TV PARTNER contact the above E-maill address. MORNING Anointed Water and all new anointed christian materials. This information is for those people that are ready to make a change in their lives. Those people that desire MIRACLE AND DELIVERANCE,FINANCIAL AND SPIRITUAL BREAKTHROUGH. Your testimonies will amaze the world as you place your order in the name of Jesus. EMMANUEL. Distance is not a Barrier. we awaiting your details…. May the good Lord Almighty meet all your needs according to His glorious riches in Christ Jesus. May He teach you what is the best for you and direct the way you should go. May He give you more than you need so that you will always have all you need for yourselves and more than enough for every good cause. May He fill your house with His glory. May He richly provide you with everything for your enjoyment. May He give you the desires of your heart and make all your plans succeed according to His will. May He lavish you with His love. May He richly bless you with all of Gods blessings. May He take care of you. May He strengthen you, help you and uphold you with His righteous right hand. In the name of Jesus Christ. CONTACT SCOAN ADMIN EMAIL ADDRESS BELOW…. :Scoan Below Email Address For years:…official email: scoan-churchworldwide@ minister.com Invitation Letter(s) to the Scoan..
May the gracious God Almighty make you the head and not the tail. You shall be above only and not beneath. May you be blessed in the city and blessed in the country. May He bless all the work of your hands and may He bless everything you put your hands to. May He grant you abundant prosperity in every area of your life. May He meet all your needs according to His glorious riches in Christ Jesus. May you find great delight in the love of God and He will give you the desires of your heart according to His will. May He fill your house with His glory. May He show you and give you His incomparable riches of His grace expressed in His kindness to you. May He strengthen you, help you and uphold you with His righteous right hand. In the name of Jesus Christ. May the gracious God Almighty fulfill all His promises to you. May He fulfill all He has planned for you. May He give you the desires of your heart and make all your plans succeed according to His will. May He richly provide you with everything for your enjoyment. May you be glad and rejoice in the love of God Almighty. May He fill the arena of liberty with His glory. May He show you the path of life and fill you with joy in His presence. May He give you more than you need so that you will always have all you need for yourselves and more than enough for every good cause. May He show you and give you His incomparable riches of His grace, expressed in His kindness to you. May He meet all your needs according to His glorious riches in Christ Jesus. In the name of Jesus Christ. People of God Praise the lord brothers and sisters my name is Ruth and am from Germany, last week Sunday i was browsing through the testimony of people here and i read a lady from USA was sent the morning water from Nigeria by MRSGABRIELFAVOUR@GMAIL.COM and that it was send through GHL , I contacted her too and she told me how i will go about it that i will only have to pay 210$ to the DHL AGENT directly before 7 bottles of morning water ,books, stickers,bracelets, and video cassettes will be sent to me which i did and send my full name address and phone number lo and behold in the next 3 days i saw some one knocking at my door and it was the DHL agent i received everything a ordered from this woman i want to use this medium to thank mrs Gabriel favour for allowing God to use her for me and great thanks to our spiritual father senior prophet tb Joshua i have started seeing changes in my life since i started using the morning water hallelujah..
May the gracious God Almighty give you success in whatever you do according to His will. May you be blessed in the city and blessed in the country. May He bless all the work of your hands and may he bless everything you put your hands to. May He richly bless you and your family with all of Gods blessings. May He strengthen you and help you and uphold you with His righteous right hand. May He keep you away from all your harm and watch over your life. May He lavish you with the riches of His grace and may He lavish you with all wisdom and understanding. May He richly provide you with everything for your enjoyment. May you be glad and rejoice in the love of God Almighty. In the name of Jesus Christ. The good lord Almighty will richly bless you with all of Gods blessings. He will strengthen you, help you and uphold you with His righteous right hand. He will give you the desires of your heart and make all your plans succeed according to His will. He will richly provide you with everything for your enjoyment. He will meet all your needs according to His glorious riches in Christ Jesus. Delight yourself in the love of God and He will give you the desires of your heart according to His will. He will keep you away from all harm and watch your life. He will grant you abundant prosperity in every area of your life. He will make you the head and not the tail, you shall be above only and not beneath. May you be blessed in the city and blessed in the country. He will bless you and make you fruitful and increase your numbers. In the name of Jesus Christ.